The ‘Beaded Ring’ collection uses the granulation technique so loved in Alice’s ‘Beaded’ range. All of Alice’s jewellery is designed and made in Britain direct from her Sussex garden studio. Any of the pieces within this collection can also be made in 9ct and 18ct gold on request. This gorgeous silver ring is a smaller version of the very popular wide semi precious stone beaded ring. Available with a wide range of semi precious stones the beaded decoration surrounds the hand set stone and sits on a narrow chunky silver ring. These rings are MADE TO ORDER. 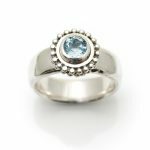 Please be sure you are certain of your finger size, by popping into the studio or visiting a local jewellers to get your finger sized, as its very difficult to change the ring size (without remaking the whole ring) once the stone is set. 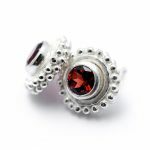 Another must have earring stud from the Alice Robson collection. 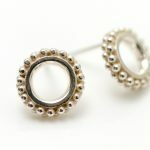 These circle studs are detailed with a double row of tiny granules all the way around the earring. 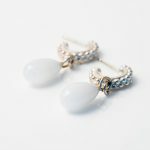 They look great worn on their own, paired up with a beaded ring pendant or any of the jewellery in the Beaded collection. Gold vermeil version shown on second model image. 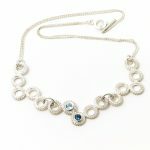 This elegant and delicate necklace is made up of a gorgeous beaded ring with a gemstone of your choice set in the centre. 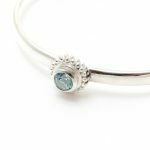 The simple beaded ring necklace with gemstone is shown here with a pale blue Topaz. 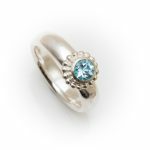 Why not add your birthstone to make it even more special. If your birthstone doesn't appear on the list (see the stone chart picture), then please don't hesitate to contact me for a quote on a particular stone. 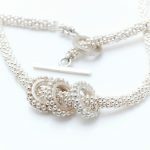 A stunning Silver necklace made up of series of grouped beaded rings. 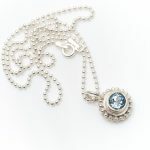 This gorgeous necklace is a real statement piece yet incredibly easy to wear. 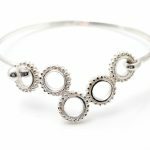 It's a brand new addition to Alice's 'Beaded' range, which is made up of series of five randomly arranged circles wrapped in tiny silver balls. The Beaded range is inspired by pebbles on the beach and uses a technique called 'granulation'. Available with up to two semi precious stones hand set within the centre rings. 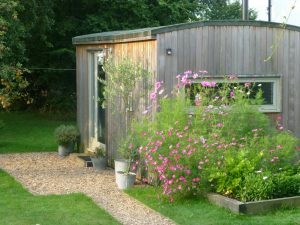 MADE TO ORDER where stones are included. 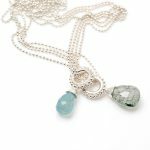 A beautifully delicate necklace with a decorative beaded ring and a gorgeous semi precious stone drop. This necklace forms part of a collection inspired by pebbles on the beach. 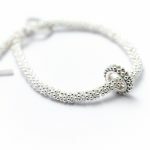 The silver ring pendant is encased in tiny regular silver granules and is uniquely connected to the chain by looping through the ring and doubling back on itself. Available with Ruby (Red), Rutilated Quartz (clear with green strands), Chalcedony (bright bluey/green). Darker blue Iolite now out of stock.